Thanks FAST. I always was surprised how fat the temp rises to warm up - just a couple of minutes. So is there any point or problem with using the Robert Shaw t-stat with a hat? Any idea what might be causing the temp to suddenly rise and fall when I'm cruising, if it isn't a sticky hat? I for one would convert the engine to the Cleveland design. There was a lot of money spent by Ford on engineering and I don't like to reinvent the wheel. The Cleveland design is not a faulty design. It is just different. As far as the rise and fall there could be something happening in the engine such as a bearing but what you described to me I consider an early warning that the theromostat is on the way out. It sounds like it is sticking partially open when it should be fully open. I personally have often ignored that warning only to have the thermostat totally lock up and over heat the engine. 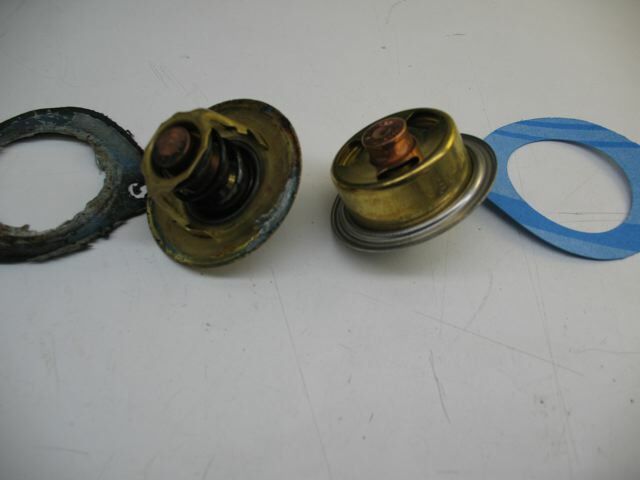 A thermostat is a mechanically "fusible link". It is the cheapest part of the engine. Just change it and see if you have the same symptoms. Some folks said I should drill a couple of small holes in the plate and the hat. Do you agree? ...Geez!! I post Pictures and You Guys STILL Don't get IT!! Yes! David B., I have TWO ideas as to why your temps are fluctuating. 1. Go back to page 4 of this thread and look at photo #5 and see the relationship between the Correct Themostat and the Brass Restrictor Plate. In the picture, ofcourse the Thermostat is, in-fact, Closed, but what I want You to see, is the 'Hat' sticking UP through the Plate; AS IT WOULD when OPENED!! The fact that You are running a BLOCKED Plate tells Me, if You ARE running the Proper Thermostat with the Hat; that the Opening of the Thermostat is being 'Jammed-Up', by the Blocked Plate, and is being Prevented from Opening Fully. This may very well have damaged Your Thermostat! 2. The first thing I see in YOUR Photo is RUST! There should be NO rust in the system what-so-ever!! This tells Me that You are probably NOT using a 50/50 mix of H2O to Antifreeze/AntiBoil (I use Prestone with great success). This could be THE defining factor of Your problem. The proper Mixture Makes a HUGE difference in Heat Transferance!! And the side benefit of using Preston is it incorperates a 'Rust Inhibitor'. Last, Yes! Your Coolant does heat-up fast! Only because it is NOT circulating, it is just 'sitting' there stagnet. Read GP's advice about thermo shock to the heads. Good-Luck with it! Marlin. Marlin, I'm stupid sometimes so help me with a few more questions. The existing thermostat has been in there for 10 years. The restrictor plate at least as long. I have never and I mean never had a cooling problem. No leaks, no wet gaskets, no drips, no temp gauge fluctuation, no nothing. I drive hard and put many miles on the cat each year and have no problems. Nada. Zip. I've never broken down in 10 years. This temp variance started last summer. So if the restrictor plate was the reason the tstat got damaged then it took 10 years. As for the rust, I use at least 50/50 Prestone and demineralised water. Probably more like 60 Prestone / 40 water. The system is drained annually and is clean and green. No discolouring. It looks brand new when I drain it! There is no debris or rust in the liquid I drain, nor in the coolant lines, hoses, tanks or rad. So yeah, I was pretty freaked out by what I saw when took the tstat out. I'll clean it up before closing it up again. But there was no indicator of any problem - no residue or moisture around the pipe or gasket when I opened it up. The front of the engine was as clean as the back! As for shockng the heads warming up, if it's causing trouble there are no signs during the past 10 years. No oil or water leaks anywhere. Heads are clean and sweat and drip free. So now what do you suggest? Contrary to what was previously said the restrictor plate you have will not allow coolant to flow out of the block until the t-stat opens i.e. there is no bypass. IMHO this is not a good mode of operation and does not help in bleeding the air from the system. It can also be dangerous to engine if your t-stat fails closed. As Marlin says the Cleveland specific t-stat hat is designed to sit down in the hole as it opens, so it may not open fully with the restrictor. Therefore if you retain the restrictor plate I would highly recommend you use a Windsor style t-stat. The next question is where is your coolant temp sensor? I guarantee not in the block or heads so do you really ever know what is going on in the block? The stock sensor location was in the pressure bottle and from the rapid temp fluctuation you describe it sounds like yours may still be there and is indicative of a sticking t-stat. The temp sensor should be relocated to the water pump which is a suction pump drawing cooler coolant from the radiator and will then be more indicative of the system as whole. I see recommendations that you remove the restrictor plate and revert to a Cleveland configuration; this is all very well as long as you have a bypass in your water pump......which takes us back to the first post in this thread. If you don't have the pump bypass in principal it doesn't matter what you run as a restrictor, as there will never be any bypassing. That said if you run a restrictor with no holes and a pump with no bypass then the area between them can get no coolant so now you have a passage that is full of air and differential expansion. For that reason I would recommend you drill a hole in the restrictor plate to allow coolant into the passage. Next point is de-mineralized water.... not recommended for coolant systems as the de-mineralized water is a non equilibrium state and it will try to find a natural balance of minerals and to get them it dissolves them from your iron block, aluminum radiator etc. Thanks Joules. Here's more info. My sensor is on the block right below the thermostat. My water pump is the stock Ford Cleveland pump. Can I remove the restrictor plate? Should I drill out the centre, make some holes in it or just leave it and use the 351W thermostat? And sorry, I meant distilled not de-mineralized water that I use with the Prestone. It sounds to me like your stat is simply on it's way out because it worked fine for ten years. I would suggest using a Windsor Robertshaw stat with the restictor plate. Drill a small hole in the plate and stat lip for air bleeding. It's kind of your choice which way to go on this. You have the right pump and the sender location is good. You have not dealt with the issue of thermal shock. I think you have a modified system now and it was done for rapid warm up. After all, the Montreal winters aren't exactly tropical are they? If you choose to stay with the current set up and just change to a new thermostat there is one thing I would highly recommend (if you haven't already) and that is run a full synthetic engine oil and an expanded capacity oil pan. You may have been getting by already on the strength and resilience of your oil. But oiling is supposed to help in that respect. If its worked for you for 10 years and you have the oem style pump, I'd recommend just using a replacement Windsor style t-stat. Hey Marlin, no offense, I wasn't kidding. I really am stupid when it comes to Pantera things that I haven't fixed or done before. And this was one of them. That's why I go to you guys on the PIBB for advice. About the 50/50 cooling you're right. But in Montreal it's 5 degrees (that's F not C!) today and it's below zero a lot over the 5 or 6 months of winter. On our Prestone containers the label says "antifreeze" not coolant. So we aren't always looking to cool more than we looking not to freeze and crack if we hit a cold spell while parked outside on a cold night. And like mine, most of our cars sit dormant in cold garages once they start salting the roads.